Quality Engineered Products, Inc. has been designing and building devices and equipment to ship, handle, up-end, and "locally" move reactor coolant pump motors for many years. 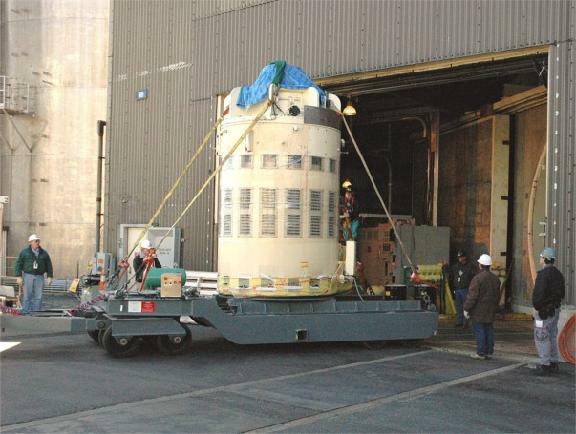 On-site transporters for moving heavy RCP motors (up to 9,000 HP) around plant sites. Usually these transporters are manipulated with either a yard tractor, dry cask airplane mover, or even plant-owned boom cranes. Transporters have been designed to accommodate equipment hatch clearances and limited crane access situations. Some transporters have been supplied with air-operated hydraulic disc brakes that tie into the towing device's air brake system. Internal support spider devices to allow large motors to be up-ended for extraction or insertion through equipment hatch doors and for transportation over-the-road. Shipping frames with built-in up-ender pedestals. Weather tight shipping containers for shipping RCP motors. These frequently include internal stainless steel drip pans, internal motor anchor points, and external DOT placard mounting locations. RCP motor storage & test stands. QEP designed and built a handling fixture to facilitate a reactor coolant pump closure stud upgrade project at Three Mile Island. The project's goal was to build a fixture that could rapidly deliver the new Hydranut studs to the pump location by having them pre-staged on the fixture. The fixture was also designed to allow storage of the old studs in the same manner, dramatically reducing handling time and worker exposure. The fixture also had integral chain fall hoists so that it essentially became a "stand alone" maintenance device requiring minimal support for the project after the fixture was installed. Part of the project was also to supply a mock-up for pre-outage training. 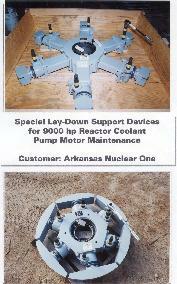 A custom removable goose neck low-boy trailer designed and built to handle Indian Point reactor coolant pump motors. 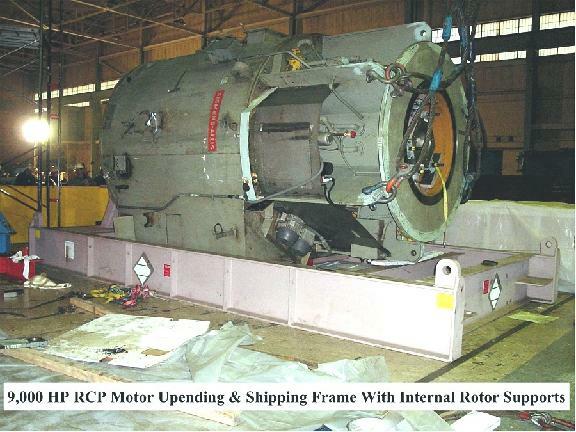 This allowed relatively quick insertion and removal of an RCP motor in and out of containment. The removable goose neck was necessary to allow passage of the polar crane gantry legs. This trailer was also designed for dual purpose use in handling "C-Van" storage containers when not needed for a motor move.